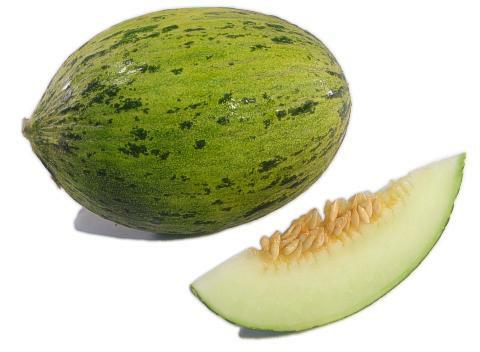 General Information: From the outside a Santa Claus melon, with its long oval shape and splotchy green-and-yellow skin, looks like a small watermelon. Inside, however, its yellowish-green flesh looks and tastes more like honeydew melon. This member of the muskmelon family grows to about a foot in length, with some specimens weighing as much as 10 pounds. Santa Claus melon, also called Christmas melon, was so named because its peak season is in December. Choose a melon that is slightly soft at the blossom end, heavy for its size and has a yellowish cast to the rind.